If your guinea pig is suddenly stuck to his water bottle and drinking non-stop, don't ignore it. Excessive thirst is never normal, and especially if it comes suddenly and for no apparent reason. Start by trying to figure out the causes yourself, but a visit to the vet might be in order if you can't find an explanation. Guinea pigs are little furry sponges. On an average day, a guinea pig will drink between 100 to 200 milliliters -- 3 to 6 ounces -- per 2.2 pounds of body weight. Female guinea pigs can weigh up to 2 pounds, while males can weigh up to 2.6 pounds -- so technically a guinea pig can drink up to 20 percent of his body weight in a single day. Excessive drinking could be a sign of diabetes, which guinea pigs can get. 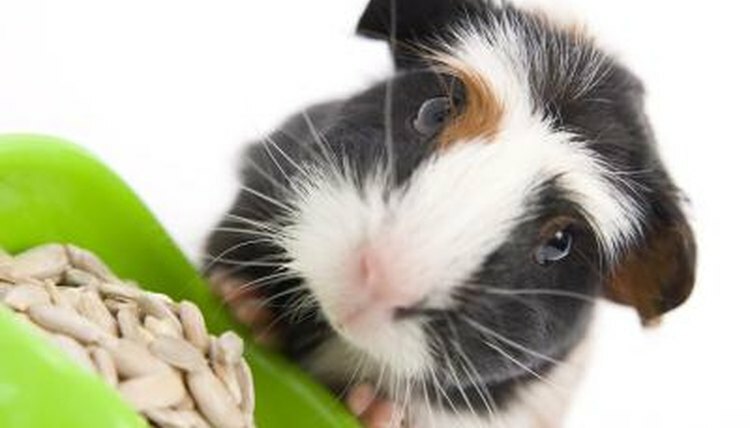 A guinea pig who has diabetes will also urinate much more than usual because of the high water intake. As a result, you might find yourself having to change the bedding more frequently than usual. Other signs of diabetes include weight loss and increased appetite. If your guinea pig's cage is in a hot spot, he might be drinking more than usual because of the temperature. Just like you drink more in summer, your guinea will drink more if the heat factor has suddenly started to creep up. Try moving the cage away from the heat and make sure there's no direct sunlight shining over the cage at any time. This could quickly overheat a guinea pig. Guinea pigs can experience kidney failure, which happens when the kidneys stop working and can no longer excrete the toxic waste products the body produces. In guinea pigs -- just like in humans -- a common sign of kidney failure is excessive drinking, accompanied by increased urination, weight loss, lethargy and vomiting.